Heart Portraits and Heart Sketches are heart drawings that offer insights into the state of one’s heart and life. The colors, textures, and forms of each heart portrait give information about a person, the relationships, joys and pains, the energy within, and/or the context surrounding the person. “How long have you been tuning into people’s hearts?” she asked when I gave her a drawing of her heart. I had been drawing hearts for several years. Most of the time, the drawings reflected the stirrings of my own heart, other times they showed how I saw the heart of the world. And sometimes, without the realizing I was even doing it, I was drawing reflections of other people’s hearts. Two days after her question, I wrote in my journal, “I would like to draw people’s hearts.” Since then the images have been flooding in, at first for people I know; then, after reaching out to people in my networks, I began drawing for people I don't know. Vivid pictures, each unique, a snapshot of a heart at a point in time. I'd share each new image with the person and also share the insights learned through the process of creation and from the image itself. “Does that resonate? Does this feel true?” I ask. The answer, each time, has been yes, and yes, and yes . . . Very quickly, I realized: This is my work. I am called to tune into people’s hearts, to draw the image that emerges, and to share the insights. It is an intuitive process, a sacred process; it is an honor. Having our hearts seen is healing. When you commission a heart portrait, you are agreeing to allow me to tune in to your heart for a time, and to interpret what I discover through drawing. The tuning in is not a process that requires communication or information- in fact, it is best for me to have no information about you beyond your name. After creating the portrait, I provide a description to accompany the drawing, explaining the insights gained from the process. You will receive both the original 5" x 7" drawing AND the written interpretation by mail or in person. The process of tuning in, drawing, writing the interpretation, and readying both the portrait and interpretation for you takes 3 to 4 hours. For an additional fee, you can also schedule a personal consultation - via phone or in person - for a deeper conversation about the insights. Because people’s hearts are so beautiful, I share heart portrait photos on social media. No personal details about the client are shared with the photo. 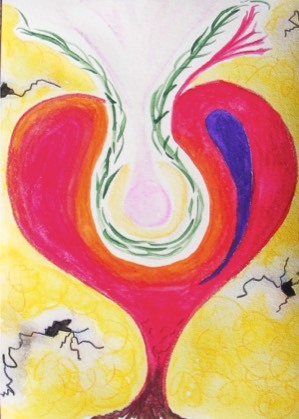 When you commission a heart sketch, you are agreeing to allow me to tune in to your heart in your presence for a 20-minute period, and to interpret what I discover through drawing. During our appointment, I will share insights as they come. This may happen as I am drawing, as I am applying water (I use a combination of pencils and watercolor pencils), or after I have completed the drawing. You are welcome to ask questions as I work. I do not provide a written description to accompany heart sketches, and you are invited and encouraged to take notes as we speak. You will receive the original 4" x 6" drawing to take with you. Heart sketches are only $20 through the end of April when you use the code 10OFF. Because people’s hearts are so beautiful, I share heart sketch photos on social media. I love to take photos of clients and their sketches. I do not post photos of you without your permission. I do not share personal details about clients or insights from the portrait. You are welcome to share anything you’d like from the experience. Are you interested in bringing the heart sketch experience to a small group you belong to? I am available to come to your event to create heart sketches for 4 to 8 people. Contact me below to discuss options.